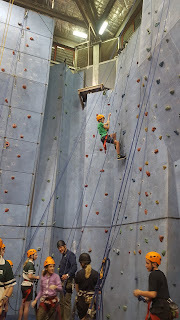 Please excuse the quality, it's hard to photograph when you are short and the room is really small! 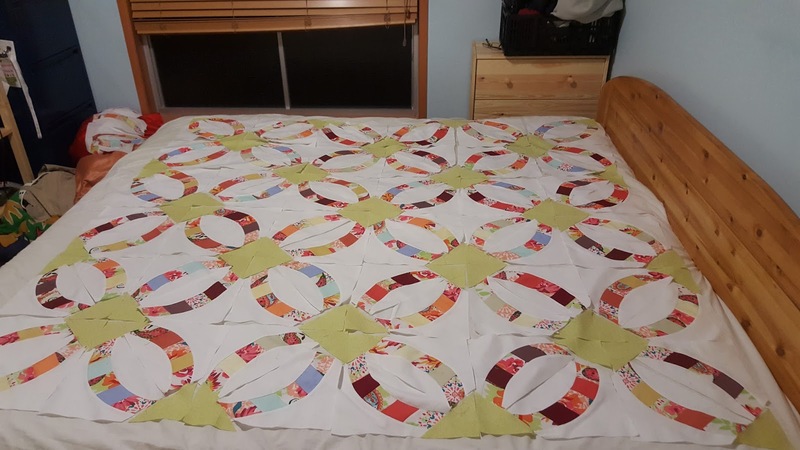 Here they are laid out on Mstr(almost)15's double bed, I think 42 blocks would make a nice double size quilt. As you can see I have included some solids into the Malka Dubrowsky collection as several of you had suggested. I tried to find a selection of neutral fabrics for the circles but it remains very busy, so I'm thinking I'll put a similar weight cream around it as a border once all the blocks are joined rather than following the pattern with half blocks etc. The rest of my sewing has been sorely neglected, work has been very busy with a week in Darwin, a trip to Sydney and 5 more nights away over the next fortnight. I even skipped the last sew-in as I had just gotten home but I plan to go to the next one. Suz and I have settled on our feature fabric and will sort out details of our trans-Tasman block swap soon. Hope life is treating you well! Happy Sewing! Giant Chevron: After I quilted all the inner, I started with the coloured parts of the quilt, adding very organic matchstick quilting to the black and the red - maybe chopstick quilting would be a better term for it as my lines are 1/8 - 3/8'' apart? (I will have to take a photograph to add here). 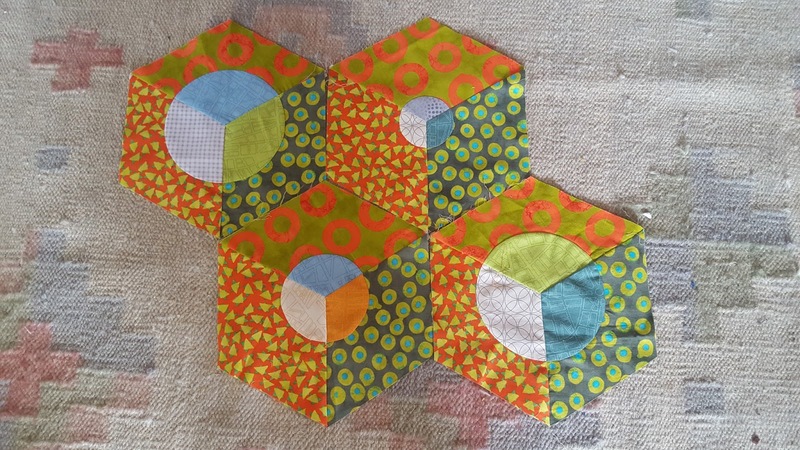 For the blue and the yellow parts I've been thinking about Judi Madsen inspired quilting, parallel lines to fill in with different designs. I attempted to fmq my straight lines and fill the spaces in as I went along, but I was not happy with the result, so for the second blue side I used the walking foot and then went back to fill the spaces after - much happier with this look! While it is time consuming, at this stage in my quilting journey I might just stick to this method otherwise the result will forever annoy me. 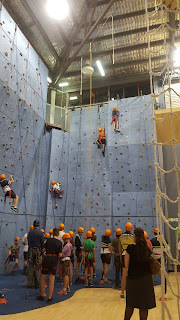 I need to get smarter about taking photographs; our house is rather dark, and with the sun going down so early in QLD I forever show you these poorly lit photographs - sorry! Obviously we were all taking pictures at the same time lol. 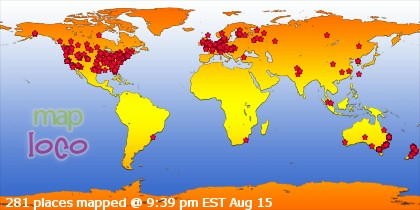 Can you spot my block? 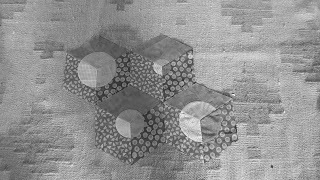 One quilter from the Brisbane Modern Quilt Guild used different measurements that's why her block on the left is a bit bigger than the others. Lorena covered lots in her class - about colour values (everyone went off to get the red plastic thingies or used the greyscale function on their phones), about rules and breaking the rules, y seams, about applique by hand and piecing circles. I had been really worried about fabric choices, ended up buying some black, white and red charms for the circles but didn't use them lol. 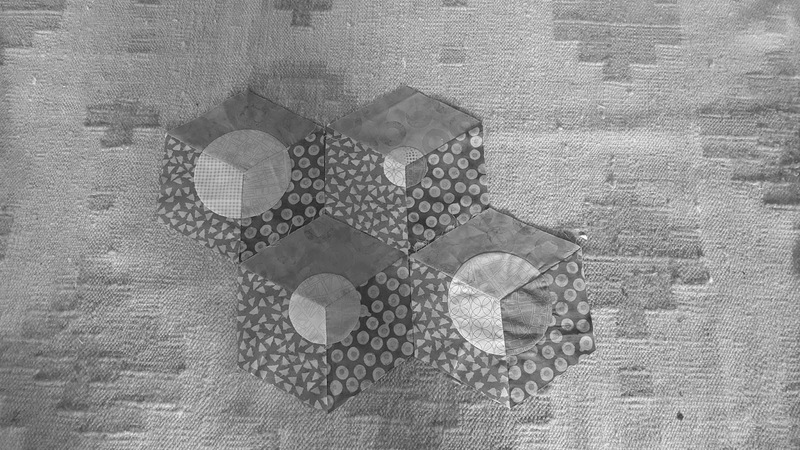 The Malka Dubrowsky fabrics seem to work fine for the tumbling blocks (though being fqs I need to be a bit careful about how I cut them as I get a fair bit of wastage), and while I started out with the Seville City map fqs for the circles, I have since added a collection of fabrics to that. The colour value part of the workshop has been very interesting. 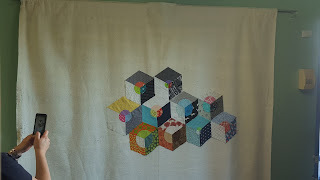 So there are three projects on the go which is great, and while I find it annoying not to have my own sewing space, having all my stuff in the lounge has made me organise it better and tidy up after use, and I feel I'm a bit more part of what is going on than when I hide in my sewing room. In the long run, though, I would like my own space again. 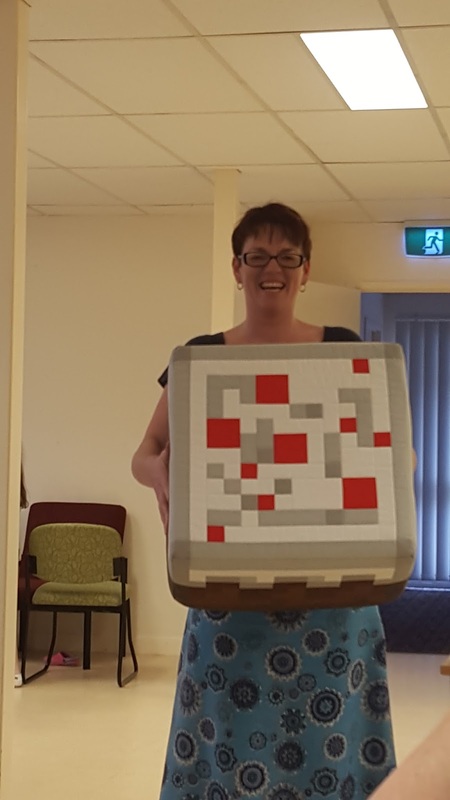 This quilter made this Minecraft cake footstool as a birthday present for her daughter - very cool! 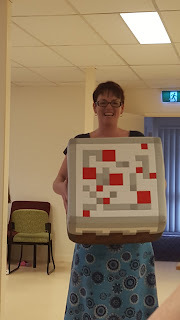 I will be talking Minecraft over the next couple of days at EduTECH - hope you get some sewing done while I do that! Happy Sewing!